Elite Solar Lighting & Fans > Solar Tubes > How Much Do Solar Tubes Cost? 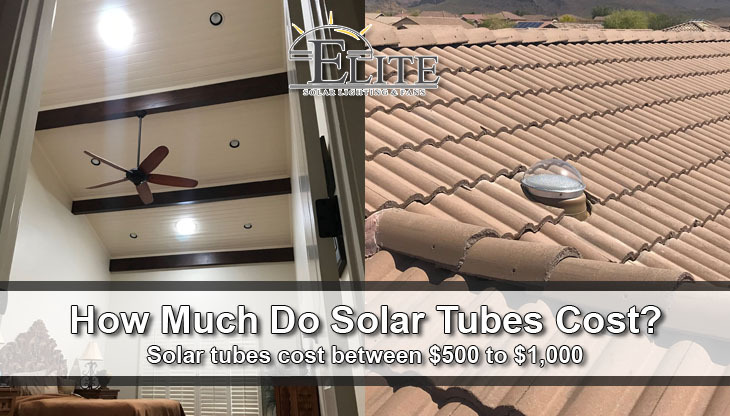 If you are searching for either of the following phrases, “how much do solar tubes cost” or “tubular skylights cost”; this post should help! Here we help you understand more about solar tubes, how much they cost and if they are right for your home. With the installation of solar tubes, you will obtain that natural light provided by skylights, but with less hassle and expense. If you have considered increasing the amount of daylight to either a dark hallway or kitchen, solar tubing is one option. Solar tubes offer plenty of indirect, warm light, at just a fraction of the costs of installing a traditional skylight. How Do Solar Tubes or Tubular Skylights Work? Solar tubes are commonly referred to as sun tubes, light tube, sun tunnels, or tubular skylights, and have a diameter of 10-inches to 14-inch tubing made from sheet metal and polished interior. The purpose of the interior is like a continuous mirror, which channels light over the entire length of the tube, which preserves the intensity of light. The daylight is captured at the roof, then delivered within the home. Solar tubing gets capped with weather-proof plastic globes on the roof, while the tube ends within a port-hole style diffuser within a room below the ceiling. Light is collected by the globe on the roof, then light is spread by the diffuser to produce a pure white glow, providing a dramatic effect. A new installation frequently has homeowners reaching to turn the light switch off as they leave the room. Learn more about how solar tubes work. How Much Do Tubular Skylights or Solar Tubes Cost? Solar tubes cost between $500 – $1,000 on average when installed professionally, whereas a traditional skylight averages $2,000 or more. However, if you are comfortable and handy with roof work, you may be able to install solar lights on your own with a kit costing around $200 – $400. Solar lights do not require additional drywall to be added, unlike a skylight. You also avoid having to alter framing or painting. *These are general estimates not an actual quote. 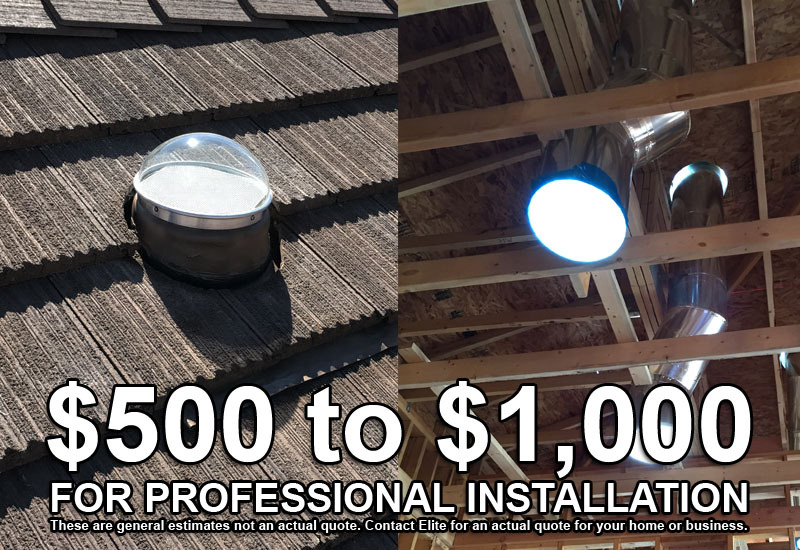 Contact Elite Solar Lighting & Fans for an actual quote for your home or business. The smallest option is a 10-inch solar tube, which offers the equivalent of 3 100-watt bulbs, or enough for a 200 sq. ft. room. A 14-inch solar tube can increase the brightness of rooms up to 300 sq. ft.
Where Can Solar Tubes Be Installed In A Home? About the only place you would not want to place a light tube is directly above a screen, such as a TV or computer, as this can create annoying glare. Can Solar Tubes Work In A 2 Story House? If you are in a two-story house, it is possible to channel the daylight down through the layers and into the first floor. You will need to have a mechanical chase or closet for running the tube through. However, the installation can get complicated due to a floor requiring being cut, or if plumbing, wiring, or HVAC ducts are in the path. Are Solar Tubes Tubes Right For Your House? Solar tubes can help you lower your electric bill. Furthermore, due to installation not requiring alternations to the frame, there’s much less limitations when it comes to locating a solar tube for your needs. Take a look at the attic space to ensure there is enough room to run a light tube, should be straight. If there is an obstruction, such as flexible tubing or elbows this may be avoidable and/or moved. Installing solar tubes are rather simple when done within vaulted ceilings, as only about a foot of tubing will be needed. Read the pros and cons of solar tubes to figure out if they are right for you. Roof slope: The majority of solar tube kits will provide flashing which may be installed to roofs that have a slope of 15 degrees (3-in-12 pitch) and up to 60 degrees (20-in-12 pitch). Roof framing space: The spacing of standard rafters are 16-inches center, with plenty of space for either a 10-inch to 14-inch light tube. However, if you find the rafters are 24-inches center, you have the option of custom ordering a 21-inch light tube that can cover 600 sq. ft.
Roofing materials: Light tube kits have been designed for use with asphalt shingles, but can work well with shakes or wood shingles as well. There are flashing adapters available for tile or metal roofs. Location: Mounting globes on southwest sections of the roof provide the highest quality results. Lcoate an area that requires running of tube that is 14ft or less. When the globe is positioned above the tagert area directly, it may be able to reflect up to 985 of the exterior daylight. However, tubes that must twist or turn can slightly reduce the quality of light produced. Weather: If you’re located within an area with high humidity, then the interior of the tube may develop condensation and cause issues. By wrapping the light tube within R-19 or R-15 insulation, the condensation can be greatly reduced. Some solar tube manufacturers provide tubing sections that have small fans built within them for the purpose of removing the moist air and reducing or eliminating condensation. If you live within areas prone to hurricanes, you may want to opt for extra-hardy polycarbonate domes.